You can’t go wrong with this show people! Three hot chicks bouncing around onstage in short, tight dresses; who cares what they are saying, they are hot as hell so you’ll stay tuned in and turned on. Poiema Productions brings another original creation to the Edmonton Fringe, The Seminar: Breakthrough. “Choose to change, and breakthrough to the new you!” This quick-paced satire takes a comical scalpel to the way we live our lives and the things we value in modern society. 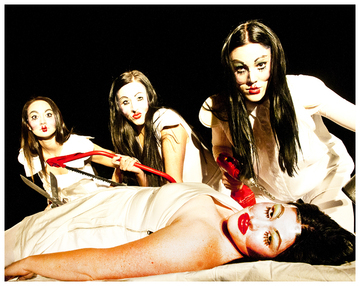 This show was inspired by their 2011 fringe hit, The Seminar: “a brilliant attack on cosmetic surgery and the extraordinary lengths people go to alter themselves, four black-haired clones push the boundaries of beauty and ugliness.” – 4.5 stars, St. Albert Gazette. “What a strange, strange play.” – 4 stars, The Edmonton Journal. Written by Poiema Productions, dramaturged and directed by Kenneth Brown, The Seminar: Breakthrough takes you into the familiar world where beauty and happiness are measured by one thing: your appearance. Read a review of the play here or you can find reviews of the original production here. Anatolia Speaks is a tale of struggle, passion, and survival when a new Canadian working at Superstore recounts her past in Bosnia to her ESL class. Candice Fiorentino gives a heart-wrenching performance of a play that celebrates the power of the human spirit. 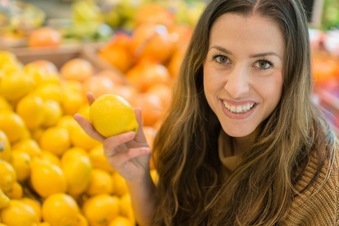 Anatolia is a new Canadian immigrant working at Superstore after fleeing war-torn Bosnia. Today, it is her turn to present to her ESL class. She is ever-cheerful and loves her new life but questions about her past reveal a darker story beneath the smile. Writer and director, Kenneth Brown, is an actor, director, musician, producer, teacher and playwright. He is the author or co-author of over thirty produced plays; his writing has been produced in five countries in three languages. Anatolia Speaks toured in the 2013 London and Edmonton Fringes, the 2014 Winnipeg and Vancouver Fringes, and also had independent showings at The Nanaimo Centre Stage and The Stage Door in Cranbrook, BC. Anatolia Speaks can be seen this year at the Toronto and Victoria Fringe Festivals. Click here for reviews of Anatolia Speaks. Middleton: a folk musical brings you to the heart of the East Coast. Set in the Annapolis Valley in Nova Scotia, this original folk musical takes place in a small town steeped in love, grief, and gossip, where life seldom changes but is rarely what it seems. Life is routine and predictable in small town Middleton, until the arrival of an outsider sends this seemingly peaceful town into disarray. A man wishing for normalcy, a daughter yearning for bigger things, and a couple of old biddies gossiping about it all, Middleton holds the familiarity of every small town. An unfaltering desire to keep life the way it's always been, shows just how easy it is to get lost in the deceiving comforts of home. Music and lyrics written by Grant MacEwan graduate, Danielle Knibbe, along with her band, Marilla. From banjo-filled folk songs to raw and intimate ballads, the show is infused with a unique modern take on the traditional East Coast sound. The show was created by Poiema Productions, written by Brianne Jang & Sara Vickruck, and designed by Melissa Heagy & Candice Fiorentino. Joining the 'Poiema Gals' this year were director- Louise Large, fight choreographer- Afton Rentz, graphic designer- Michaela Blackwood, stage manager- Mark Blackwood, and actors- Trent Wilkie, Corben Kushneryk, Brennan Campbell and Erik Reuter. 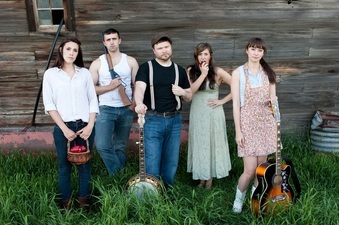 Middleton: a folk musical premiered in the 2012 Edmonton Fringe and also had an independent showing at the Key City Theatre in Cranbrook, B.C. Click here for articles on "Middleton: a folk musical". The Seminar is an original dark satire that takes a look at how far people go for beauty and what defines perfection. Never before have you seen a gathering quite like this. Three hosts out to change the world one body at a time. Will you choose to change? Using grotesque characters, creepy surgeries and an in-your-face approach, the show follows the formula of a real seminar: audience interaction, multi-media presentation and an opportunity to change your life. Change is a choice, so choose to change. "Attention all UGLY PEOPLE: Come join our family and become a new you, a happier you, and an acceptable you. The Seminar gives all you ugly people out there an opportunity to change your lives. Don't let your genetics define who you are. You can choose a better life when you choose to join our program. A photo speaks a thousand words, and they aren't about your personality!" The Seminar toured the 2011 Canadian Fringe Circuit visiting Winnipeg, Edmonton, Victoria and Vancouver as well as an independent showing in Cranbrook, BC. Click here for reviews of The Seminar. Photography by Brittany Paige Photography. Poiema Productions presents the original musical comedy, Happily Ever After? Full of music, large dresses, and plenty of laughs, Happily Ever After? questions the true definition of happiness. We have all seen the Princesses riding off into the sunset, but where exactly do they go? 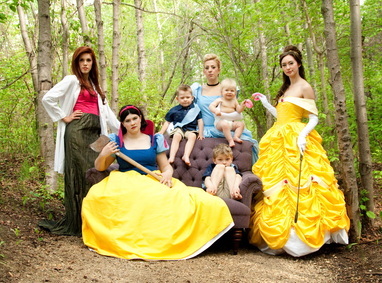 Your favorite princesses are all grown up, and their audience should be too. In a world where love is a formula and happiness is guaranteed, the emergence of adult problems causes each character to re-evaluate their own meaning of happiness. A beast in the bedroom, a very dark closet, and a newfound love for a certain body part, can all be found in this fast paced musical comedy that will question fairy tale endings. With director, Adrianne Salmon, composer, Janice Flower, and artistic director, Kim Meiklejohn, the show has become a wonderfully funny and entertaining performance the entire cast is proud of. Happily Ever After? toured the 2010 Canadian Fringe circuit visiting Winnipeg, Edmonton, Victoria and Vancouver as well as an independent showing in Cranbrook, BC. Click here for reviews of Happily Ever After?.